Joseph Christian, or J.C. or “Joe,” Leyendecker (1874–1951) was an émigré illustrator who indisputably altered the American self-image. He illustrated dozens of Saturday Evening Post covers, for which Normal Rockwell is actually more famous. 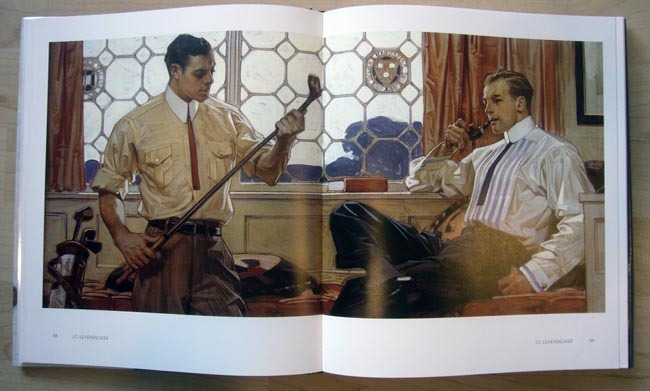 But J.C. Leyendecker by Laurence Cutler and Judy Goffman Cutler clearly states that Rockwell copied Leyendecker. Also ingrained in the American popular psyche was the Arrow Collar Man, a strong, upstanding gentleman who epitomized the term “white collar.” The model for Arrow Collar Man was Leyendecker’s homosexualist lover unit Charles Beach, who was born “in Ontario, Canada” in 1886. Observing Leyendecker’s illustrations brings me back to an era I never lived in – where actually gay artists seemingly saw no difficulty spending their days illustrating cherubs, mothers, and related touchstones of nuclear families from which they were excluded or estranged. I lack that kind of imagination, not to mention any soft-focus memories of such nuclear families. Relatedly, I cannot understand how gay screenwriters and novelists manage to write so effectively and accurately and even lovingly about families they don’t fit into, even if they think they do. The explanation seems to be that there have always been female-identified homosexualists, and sellouts. Leyendecker viewed his own life as a secret, maintaining a public persona that would later become the midcentury norm with dashing Hollywood actors. But what of Charles Beach? He would conclude his life the way Bill Tilden did. After the funeral and mourning period, a deeply shaken and despondent Charles Beach stood alone for the first time in half a century. Anguished by the loss of his lover, there were no friends to lean on [and] no servants, and his impending fate was obvious. On August 28, 1952, Charles Beach died alone at age 70, without objects to remind him of his past, only foggy memories of the glory days…. The location of his gravesite is a mystery, for he had no people in the United States and few friends left; he had only Joe nearly his whole life. While Joe kept Charles a secret, he spent all day elucidating Middle America to itself. Gay artists have a duty to refrain from lying in plain sight.